Having a large music collection inevitably leads to duplicates too. Finding duplicate files by going through your entire music library and listening to every song is impractical and time consuming. The better choice is to use a dedicate software tool to do the hard work. Standard Duplicate file finders will not help in this situation as the only thing they can do is to find exact duplicates which rarely is the case. For cleaning up your music library and reclaiming lost hard disk space best thing to do is to use a dedicated Audio Duplicate File Finder. The following application has been specifically selected to help you in tidying up your digital music collection. Audio Dedupe is an innovative tool that does not rely on file size, name or ID3 tags in order to identify similar or duplicate songs. It “listens” to the songs in order to find similarities in a way that a human would do. It is much more effective than a standard duplicate file finder as most duplicate files are stored in different file formats using different algorithms and a tool like Audio Dedupe is the only solution in this situation as the actual binary data of the duplicate audio files is completely different. The only solution to this problem is the true audio analysis in Audio Dedupe that can identify the similar files. Organize songs in music libraries with a precise and easy to use tool. Reduce backup disk space and time. Reduce antivirus scan time and file counts. Powerful search engines – true audio analysis and audio comparison. Works with removable media devices like iPod, Mp3 Players, Flash Drives, iPad, iPhone etc. Save project files in order to review them at a later time. Exported to XML and CSV (EXCEL) file formats. Duplicate Mp3 Finder, is a permanent solution for organizing audio collections. This is not a basic CRC32 Checksum or Byte-by-Byte comparison tool – this is a TRUE AUDIO ANALYSIS award winning professional solution. Checksum comparison involves reading the file from the beginning to the end and generating a unique number calculated based on its content and can not help in finding similar files. 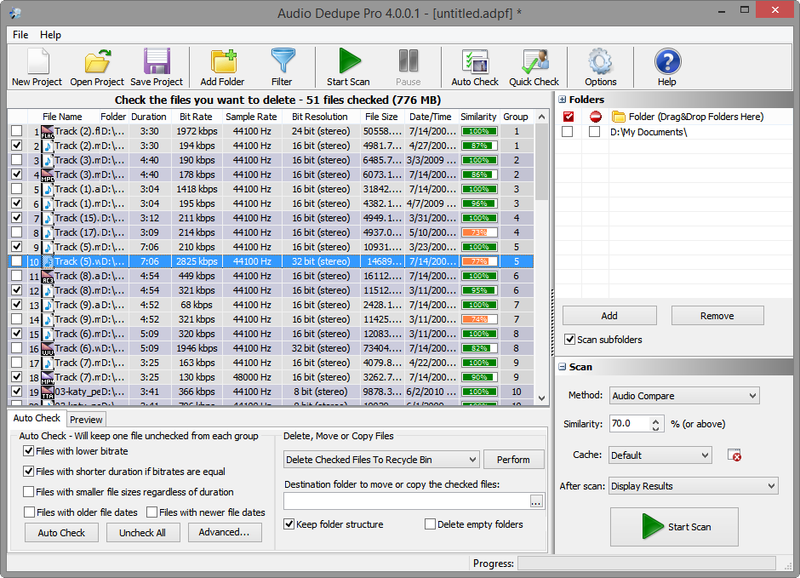 Unlike common duplicate file finders Audio Dedupe listens to the songs in order to find similarities.